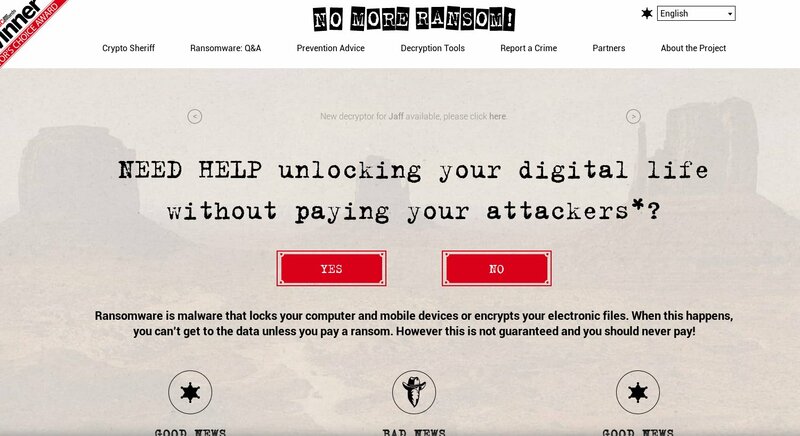 No More Ransom is a joint effort by Europol, the Dutch police, Kaspersky and McAfee to help people who've been compromised by ransomware get their data back without paying off criminals. It's "a repository of keys and applications that can decrypt data locked by different types of ransomware." There's still ransomware out there it can't unlock, but it can get your data back from dozens of ransomware strains. It's no secret that ransomware, which encrypts data on users' systems and then demands a ransom, has become a huge problem for cybersecurity over the last few years. It has become so widespread that it could easily be called an epidemic. The number of users attacked with ransomware is soaring, with 718.000 users hit between April 2015 and March 2016: an increase of 5.5 times compared to the same period in 2014-2015. The police cannot fight cybercrime, and ransomware in particular, on its own. And security researchers cannot do it without support from law enforcement agencies. Responsibility for the fight against ransomware is shared between the police, the justice department, Europol and IT security companies, and requires a joint effort. Together we will do everything in our power to disrupt criminals' money-making schemes and return files to their rightful owners, without the latter having to pay loads of money.